The crowdfund closed at the end of June – I hit the target which was wonderful, but I found myself rather ragged and somewhat addicted to social media, or at least habitually checking in for updates far more than felt healthy. So for the last month or so I’ve had a bit of a detox and have been spending more time with a needle and thread than my smart phone. I’ve even been sewing with my two and half year old son. I bought him some blunt plastic needles and he’s been ‘stitching’ with some yarn and an old jumper off-cut. Piles of mending have built up over the last year and my son got involved during his first sewing machine lesson. He was so excited to help thread my machine and after a bit of practice is actually quite adept at using the presser foot, though we did have a few issues with tension (the machine’s, not mine!) Together we repaired a pair of my husband’s tracksuit bottoms and I felt so happy that it was something I could share with him and that he’s learning about mending at such a young age. One afternoon I sat in the garden and darned a top I’d just bought from a charity shop while my son did some digging. He occasionally came over to watch and ask if he could help. The top is a very fine knit so I couldn’t take him up on the offer but it was such a lovely afternoon and wearing it will always make me think of that day in the garden. 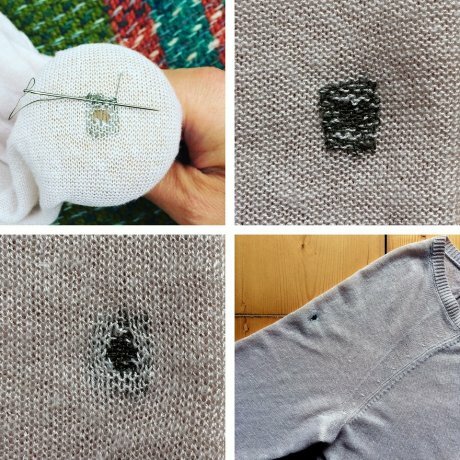 I chose a visible mend which made the job easier as I could see the new thread more clearly, plus it’s a talking point - when people see the darn and ask me about it I feel proud to tell them that I repaired it, and I gently encourage them to do the same. Over the summer I’m working on delivering the rewards from the crowdfund and from September I’ll start work on the research to set up the Bristol section of the ‘long-life style’ directory. 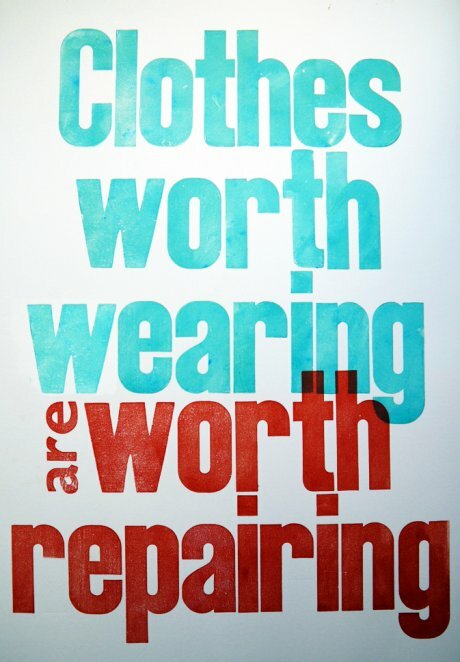 It will be a carefully curated resource of conscious fashion businesses and projects in Bristol, everything from vintage boutiques, ethical fashion shops and charity shops to haberdashers, repair cafes and sewing classes. It will serve to make it as easy as possible for people here to dress more mindfully and help to promote the best of Bristol's conscious fashion scene across the UK and further afield. One aspect of the crowdfund campaign that I loved was collaborating with other makers for the rewards I offered. I’ve always wanted to be able to offer handy, ethically sourced making and mending supplies and I’m now considering starting to retail some of the lovely things we created for the project – watch this space. If you’re interested to know about the crowdfund then you can find more info here and you can see coverage in Bristol 24/7 here. For updates on the project then you can sign up to our mailing list or follow TheGoodWardrobe on Twitter and Instagram.